Touchscreen gaming has its charms but sometimes getting hands-on with a physical controller can’t be beat. Computer Engineering graduate Rich Degenhardt decided he too would like the tactile feedback that only real buttons can provide. With that in mind, he set to work on getting a Super Nintendo controller talking to his smartphone. 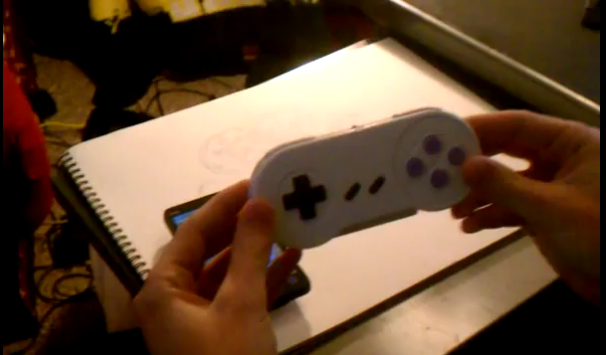 Completed as part of a senior design project, the DIY job sees a SNES controller modified so that button presses made on the control pad makes magic happen on a linked Android device--no rooting required. Once the modder had cracked just how the old SNES controller’s signalling worked an Arduino board was introduced to get the phone and controller linked up. In addition to making use of an Arduino board, this neat little project also plays host to a BlueSMiRF Gold Bluetooth module. With the Arduino board tasked with conveying the inputs to the Android phone via the Buetooth controller and a 4-AAA battery pack powering the whole operation, all these extras needed a home. Modder Rich created a custom enclosure to house all the circuitry resulting in an aesthetically modified SNES controller. Check out Rich's site for more information, and for instructions on how he created this hack.